One of the many strengths of Physitrack is the possibility to add your own content. 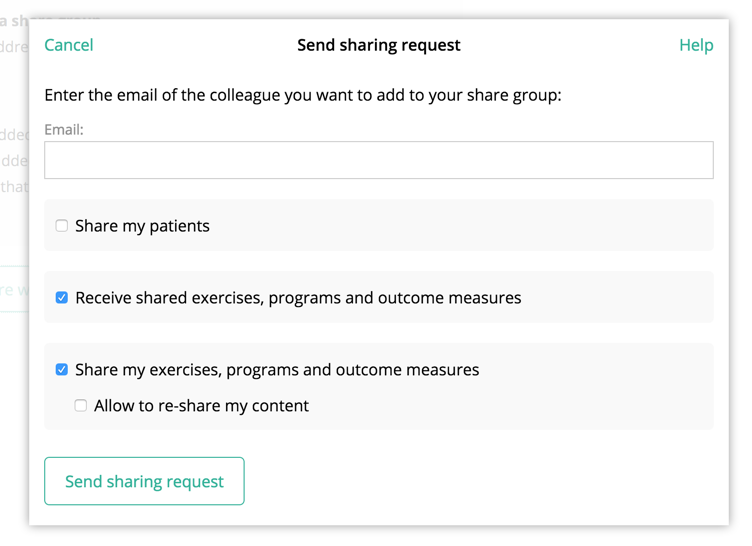 By setting up content sharing with your colleagues, you can quickly benefit from the joint expertise in your practice. You can also share clients with your colleagues. When the author updates the shared content, the updates are also visible to the recipients. Click "Add colleague to share with"
Enter the email of the colleague that you want to add to your share group. Note: the colleague needs to have an active Physitrack subscription. The colleague will show as a "Pending sharing request"
Your colleague receives an email to notify him of the sharing request, and can go to My account > Sharing to accept your sharing request. Practice with more than 10 practitioners? For practices with more than 10 practitioners, we have a specialised sharing solution. Please email sales@physitrack.com to learn more.